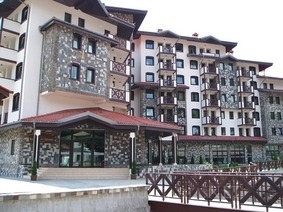 Rhodopi Home Hotel in Chepelare Ski Resort, Bulgaria. Book online! Location: Rhodopi Home Hotel is located in the centre of the mountain town Chepelare, which is only 10km away from Pamporovo resort. Some of the greatest natural and archtecture attractions of Bulgaria- Bachkovski Monastery, Chudnite Mostove, Yagodinska Cave and Dyavolskoto Garlo Cave are situated nearby. The great ski pistes of Pamporovo and Chepelare are just minutes away from the complex. Accommodation: Hotel Rhodopi home offers 29 double rooms, 19 two-bedroom apartments and 3 three-bedroom partments. The rooms are spacious and comfortable with luxury furniture, all equipped with a telephone, TV set, minibar, central heating and balcony. All of the bathrooms have bath-tubs. Apartment amenities: The apartments have a fully equipped kitchenette, cosy living room with fire place, bedroom and balcony. The bathrooms are equupped with bath-tubs. Spa Centre: Guests of the hotel can also use in-door swimming pool, sauna, jacuzzi and steam-bath, massage rooms and solarium. Meeting facilities: It is a preferable place for winter sports and mountain holidays, as well as for meetings, seminars and other business events. Rhodopi home offers a conference room for 50 guests with all modern technical equipment. Free parking lot is offerd to guests of the hotel.